Bus from Kuantan to Johor Bahru is one of the popular bus services in Terminal Sentral Kuantan. Bus from Kuantan to Johor Bahru remains only option in market because of lack of budget airline and train services between the two cities. Many locals as well as tourists rely on the bus service to travel from Kuantan to Johor Bahru. Transnational, Maju Express and Plusliner are the few well-known bus companies providing bus from Kuantan to Johor Bahru. The largest player for this bus service is Maju Express providing 5 daily departures. Their combined trips have total up to 13 daily trips. The first bus service starts as early as morning 9am while the last bus service leaves Terminal Sentral Kuantan at 11.45pm. Both Transnasional and Plusliner are government bus which serve with great reliablity. As for Maju Express, it is popular among the locals because of its spacious and thick cushion seat. Duration required for bus travel from Kuantan to Johor Bahru is approximately 5.5 hours depending on traffic and climate condition. The ticket price for bus from Kuantan to Johor Bahru is charged in the range of RM 29.10 – RM 30.40 depending on the choice of bus operator. The coach would passby Pekan and Kuala Rompin before having a stopover at Endau area for passengers' food and toilet break. After that the coach continues the journey to Mersing and Kota Tinggi before terminating at Johor Bahru Larkin Bus Terminal. The coach would for 5 minutes at both Mersing Bus Terminal and Kota Tinggi Bus Station for passengers drop off. 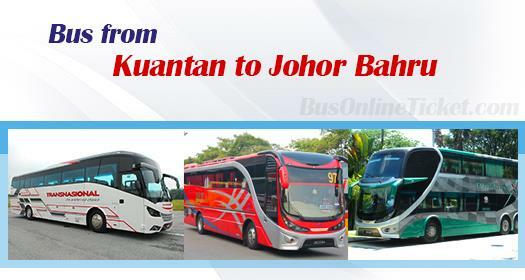 You can book your bus ticket from Kuantan to Johor Bahru online now from our official website BusOnlineTicket.com or via mobile app which can be downloaded for free on App Store or Google Play just a fingertip away.